These filters are generally used for filtration of 15 – 20 microns particle sizes. 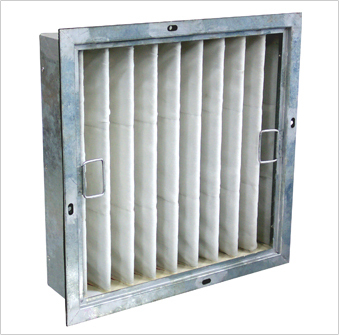 Air conditioning and air handling units etc are the areas where these filters used widely. The media used for these filter are synthetic non woven type (polyester, poly propylene felt etc),. All these are washable in nature. The material used for filter casing are either mild steel, galvanized steel, aluminum or stainless steel. Casing types available are box type or flange type. Synthetic media with Gl mesh supported in multiple ‘V designs are also offered where air flow rating is very high and low pressure drop is required.